I make additions and corrections to this web site frequently, but because they are buried somewhere on one of the pages the changes are not very noticeable. I decided to create this blog section to highlight new material. Here below you will find part of one of the pages that I have recently either changed or added to significantly. 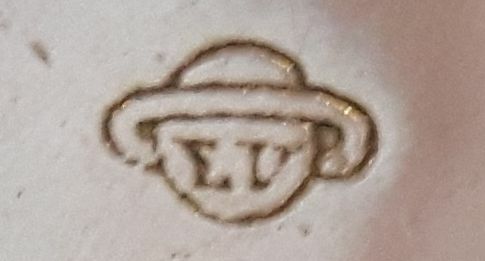 This section about mystery trademarks is from my page about Swiss marks that can be found at Swiss Hallmarks Other Case Marks. I have solved two of the mysteries, if you can help with any of the others please get in touch. All contributions will be acknowledged. One trademark that I get regularly asked about is the ships helmsman or sailor with a ship's wheel shown in the images here, sometimes also called the ship's skipper or pilot. 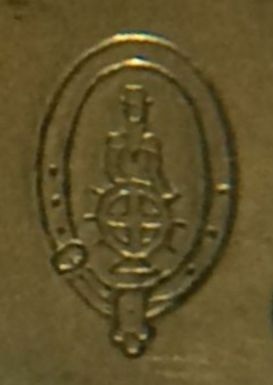 The entry from Kochmann's "Trademarks of European Origins" shows that the helmsman image was registered by Coullery Freres of Fontenais, Switzerland, in 1885 for watches and watch cases. The watches carrying this mark are usually standard Swiss bar movements with cylinder escapements. Another trademark that crops up fairly often is a ringed planet that looks like Saturn with the initials EV on the lower part of the planet. This trademark was registered in 1887 by Etienne Varin of Fontenais, Switzerland, a watch case maker. This rather splendid knight's helmet, with open visor and apparently empty, crops up in Swiss watch cases. Unfortunately I have so far been unable to identify who the trademark belonged to. 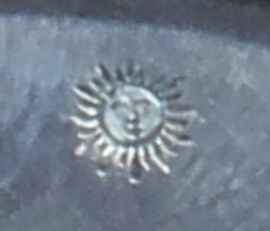 The three bears (a small one above the visor and two larger below the helmet) and 0.935 fineness stamp show that this case was definitely hallmarked after 1 January 1888, and most likely before 1 June 1907. The two radiant sun marks here both come from the same pocket watch. The watch is Swiss, with an 18 carat gold case carrying the Swiss hallmark for 18 carat gold, the head of Helvetia. 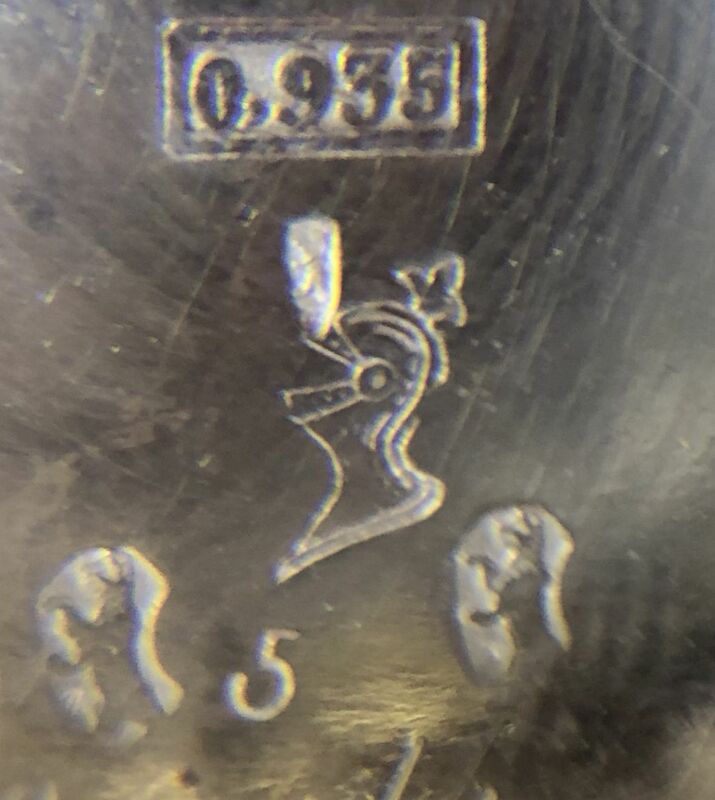 This shows that it was hallmarked after the Swiss Precious Metals Control Act of 23 December 1880 introduced a uniform system of hallmarking for watch cases to be used throughout Switzerland. As might be expected for a watch with such a valuable case, it has well finished and fully jewelled (15 jewel) Swiss lever movement. 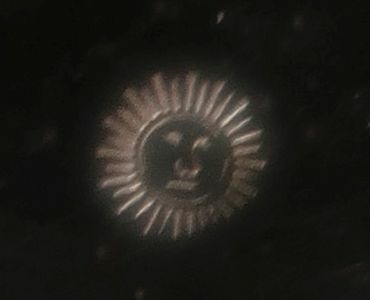 Unfortunately I have been unable to identify the owner of the radiant sun trademark. The sun was used by a lot of different people, I found 222 entries involving sun symbology, but none was exactly the same. 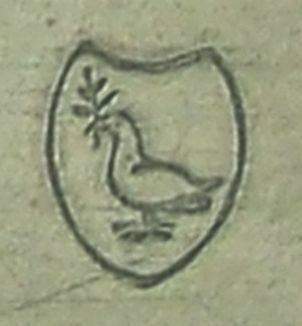 This trademark of a dove with olive branch was registered by the watch case company ‘Fabrique de Boites La Centrale’ of Bienne on 24 April 1922. La Centrale was founded by the Brandt brothers in a factory building that they had initially rented and then purchased from Schneider & Perret-Gentil in 1880 as their first factory in Bienne. La Centrale was set up in this factory in 1896 to make watch cases for Omega. Copyright © David Boettcher 2006 - 2019 all rights reserved. This page updated September 2018. W3CMVS.